The Advent Season begins on the Sunday four weeks before Christmas Day, either the fourth Sunday in November or the first Sunday in December. The word Advent comes from the Latin word adventus meaning arrival or coming. Advent is the beginning of the church year, a season of expectation and preparation, as the Church prepares to celebrate the coming of Christ. Church decorations are simple and spare and the church colour for Advent is purple, a sign of royalty, as we prepare for the coming of Christ the King. At St James's Church the first Sunday in December is an All Age Christingle Service. St James's Players accompany the hymns and play other music during the service. The uniformed groups join the service and participate by carrying their flags in a colourful parade through the church. 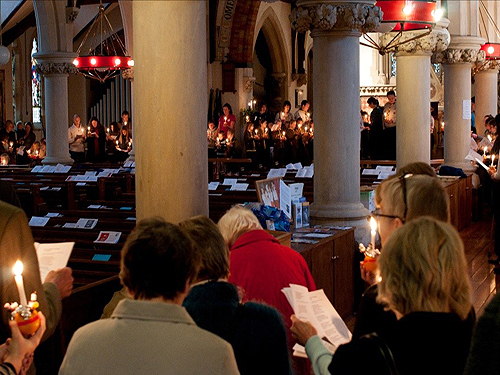 Towards the end of the service, every member of the congregation is given a christingle and then everyone forms a circle round the darkened church (shown above). The christingles (meaning 'Christ-light') are then lit, and we pray and then sing the last hymn together. We make an Advent Wreath, a symbol of Advent. 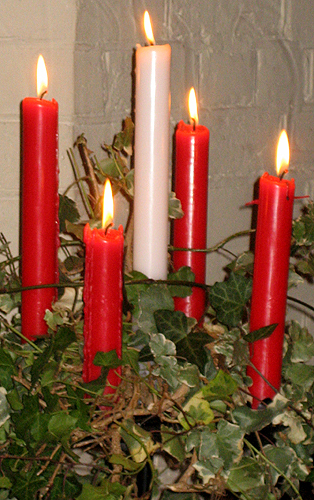 It is circular with four red candles placed around it and a fifth white candle in the centre. The outer candles are lit week by week during the Advent Sunday services, one candle in the first week, two in the second week and so on. The candle in the centre, called the Christ candle, is lit only on Christmas morning, to mark the birth of Christ, the light of the world. It is white, the colour associated with angels and the birth of Jesus. The unlit candles represent darkness which gradually gives way to the light of God coming into the world through the birth of his son, Jesus, as the candles are lit week by week. • An orange representing the world and all it provides. • A lighted candle, stuck into the orange, representing Jesus, the Light of the World who helps us see in the darkness. • A red ribbon or tape around the middle of the orange representing God's love, present everywhere and stretching around the world to all people. • Four cocktail sticks bearing dried fruit and sweets pushed into the orange representing the four seasons and the fruits of the earth. 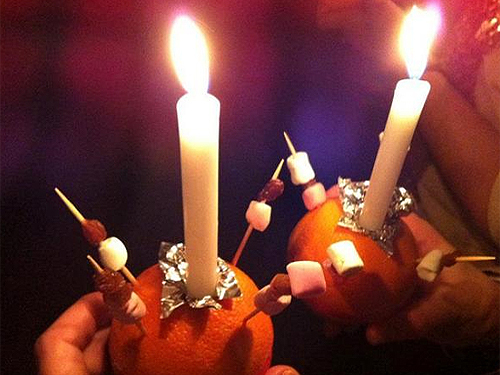 Christingles were established by the Moravian Church in 1747 as a symbol of Christ's light and love. The Children's Society introduced them to the Church of England in 1968 and they have since become a regular part of celebrating the beginning of Advent.